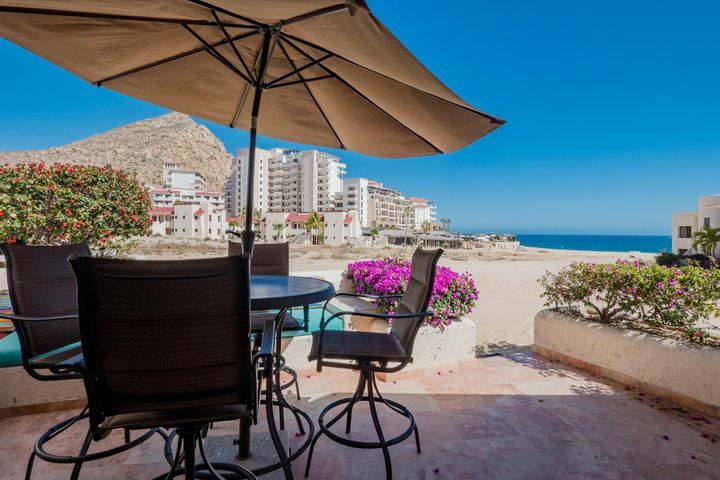 Affordable Single Level Ocean View Condo on the Beach in Cabo San Lucas! This turnkey spacious Studio in Terrasol is 1,140 Sqft. & has been remodeled with top of the line finishes such as granite counter tops, marble floors, fireplace & stainless steel appliances. Enjoy whale watching & spectacular sunsets right from your big, private terrace. Walk just a few steps to the beach & fall asleep with the Pacific Ocean surf. Terrasol is one of the landmark & most unique pieces of Real Estate in Cabo. The recently renovated common area offers palapa restaurant w/swim up bar, 2 pools, gym & tennis courts. Located walking distance to downtown, marina, swimmable beaches, outstanding snorkeling, restaurants, shopping & much more. Excellent investment property with high demand for vacation rentals. © 2019 Los Cabos Multiple Listing Service. All rights reserved. The data relating to real estate for sale on this web site comes in part from the Internet Data Exchange Program of LCMLS. Real estate listings held by IDX Brokerage firms other than Century 21 Paradise Properties are marked with the Internet Data Exchange logo or the Internet Data Exchange thumbnail logo and detailed information about them includes the name of the listing Brokers. Information provided is deemed reliable but not guaranteed. Data last updated: Sunday, April 21st, 2019 at 08:05:08 PM. Listing courtesy of Century 21 Paradise Properties.